The rapid growth of cells for research and industrial purposes such as cell biology, genomics, and proteomics has increased the potential for cross contamination of cell cultures. The cell line authentication test helps to identify the relevancy of your query cell line with the reference standard, cross-contamination in your cell line if any, and the gender of a query cell line. Our major clients are from research institutes, pharmaceutical companies, and biotechnology companies. 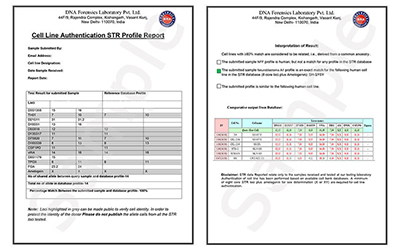 STR DNA typing generates reproducible data that comply with guidelines set by the leading scientific organizations. We are generating STR profile by multiplex PCR followed by capillary electrophoresis in a genetic analyzer and obtained data then analyzed by GMIDX software. 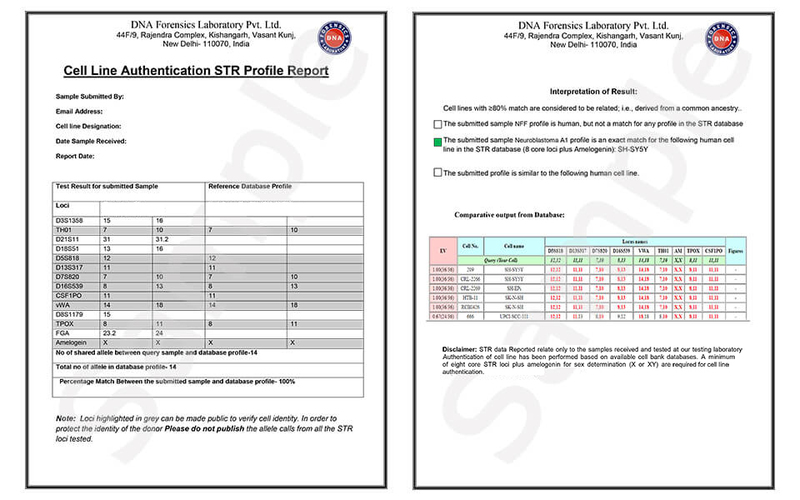 Cell line authentication is required whenever a new cell line is established. It should also be conducted before freezing at any time when the line is inconsistent. The cells must be checked the condition whether more than one cell line is handled in a laboratory to avoid cross contamination. The cells must also be checked before conducting a new experiment. NIH/NCBI/ATCC/ICLAC recommends validation of cell lines for grant applications and journals. 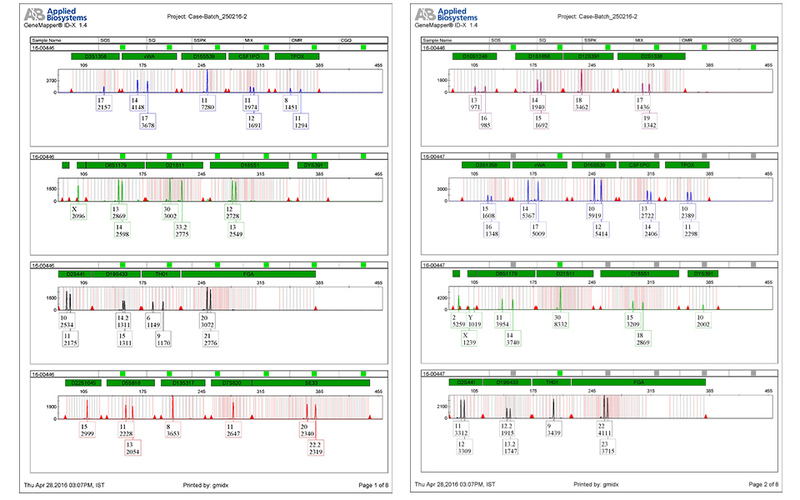 We offer complete cell line authentication services using Short Tandem Repeat (STR) Profiling. It helps to detect misidentified, genetically drifted or cross-contaminated cells that invalidate research results. We offer reliable, affordable and fast human cell line authentication services to assist the scientific associations for accurate specimens used for research purposes. Transport precaution- The sample should be collected in microcentrifuge tube and frozen at Minus 20°C and should be transported with ice pack. Transport precaution- Freeze it at -80°C Pack with dry ice. Spot on FTA- follow the standard guideline for sample preparation then spot 20 µl sample on card. Sample should be collected in 1.5-2.0 ml microcentrifuge tube with proper labeling. Extract and purify the DNA by your convenient method finally elute it in Low TE or Nucleolus Free Water. Concentration should be 10-100ng/µl. and volume in each tube should be 10-20 µl. Seal the tubes properly with paraffin. Put the tubes into a zip bag or box. Ship the sample with ice packs. Protocol for attached cells- trypsinize the cell culture and then centrifuge it with the 125 x g discard the supernatant and re-suspend the pellet into PBS to make the concentration 1.6x 106cells/ml. confirm the final concentration by cell counting if it’s more diluted then repeat the process with low volume of PBS. Protocol for suspension cells- collect and count the cells for the optimum concentration of 1.0x 106cells/ml, if it’s highly concentrated then dilute with PBS. If cells are already more diluted then centrifuge and resuspended into PBS to make concentration optimum. Spotting should be completed in Laminar flow cabinet. Before starting the work make sure cabinet works properly. Wear the gloves and properly clean the work surface of cabinet. Carefully open the FTA cards with the gloves hands don’t touch it with naked hands to avoid the contamination. Properly label the cards with the Cell line name i.e. mentioned on requisition form. Leave the cards into Laminar flow cabinet to dry at room temp for minimum 60 min. Then pack single card into a single zip bag inside the cabinet (Don’t use single zip bag for 2 FTA cards). NOTE- Before spotting, be sure about the mentioned concentration otherwise it will be a problem to generate the profile. Isolate the cells from media. Wash them with available buffer to remove extra subjects. Freeze the cells at -80°C then pack with dry ice and ship it. Ship with the ice pack. 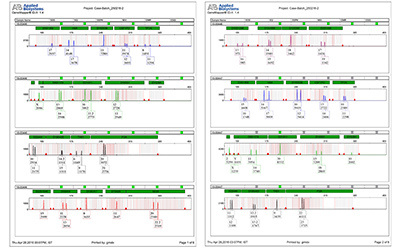 STR Profile (Data+Electropherogram) Table for all amplified loci and GMIDX generated electropherogram shows the graphical representation of STR data.